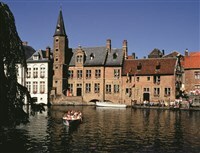 We are delighted to offer you the chance of staying right in the heart of Venice of the North Brugge. A wonderfully preserved medieval city oozing character and charm, with cobbled streets and bridges criss-crossing the canals that meander through the compact city. Early morning door step pick ups and to Dover for the ferry to Calais, we continue onward to Brugge arriving late afternoon / early evening. We return back to the North West for approx. 8pm. A beautiful 4* boutique, family run hotel in a wonderful location overlooking the restaurant lined tZand Square. Just a 10 minute stroll along the main shopping street and you will arrive in the historic Market Square. The hotel is renowned for its personal welcome and charming atmosphere, bedrooms offer TV, hairdryer and tea/coffee making facilities, and the bar and lounge offer indoor and outdoor seating overlooking the square. Lift.